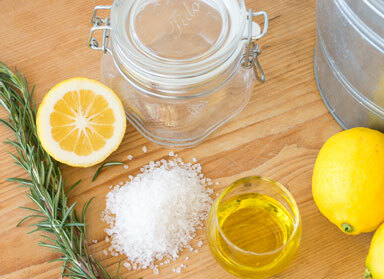 Here are some of the finest homemade beauty recipes to try this winter for glowing skin! We all know the fact that our skin is a fragile and delicate organ – the largest on our body. Exposing the skin to harmful chemicals is a huge risk we take – often never giving it a second thought. Stressful lifestyles, hectic work schedules, inadequate sleep, lack of nutritional diet, pollution, harmful sun rays (UVA/UVB), excessive smoking, and drinking alcohol are the major factors which make your skin dull and dry. Experimenting with chemical-based beauty products actually does more harm than good to our skin. This is where homemade beauty recipes come in handy as they are a natural alternative to cosmetic products. After you rustle up a pack, mask or scrub, apply it on your skin, sit back, relax, for that picture perfect skin. Mix a cup of cooled down green tea with 2 tablespoons of rice flour and a spoon of honey. Apply the paste on your skin and leave on for about 20 minutes or more, or till the mask dries completely. Massage in circular motions with wet hands after 20 minutes, to remove the dead skin cells and even out the skin tone. Wash your face with cold water. Using this recipe at least twice a week will give you clearer and even skin tone within a month. 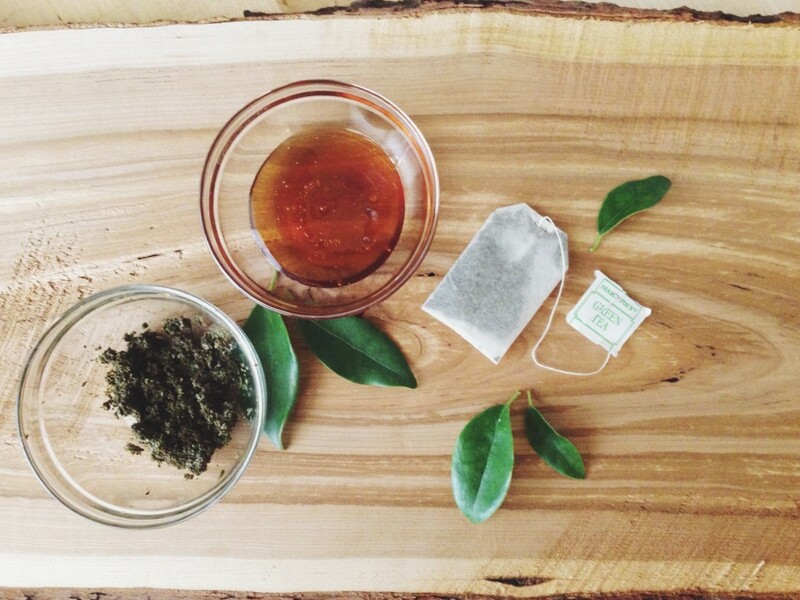 The antioxidants in green tea water will flush out the free radicals and toxins from your skin. Adding honey will help protect your face from bacteria, improve the texture of the skin and keep it moisturized. 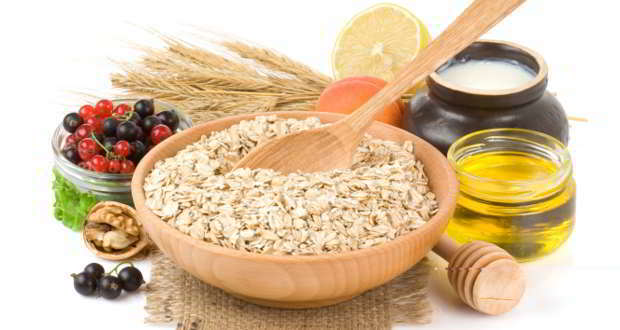 Rice flour acts as an excellent scrub to slough away dead skin and restore a glow. Mix a tablespoon of turmeric with a tablespoon (adjust the quantity to get a slightly thin paste) and apply on the face for about 15 minutes. Rinse off with cold water. 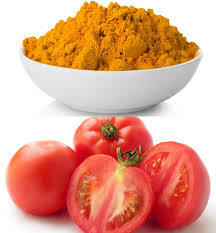 Tomato contains lycopene, an antioxidant that protects from UV damage. In addition, it also works as a great anti-aging agent. Combine a tablespoon of fresh and unflavored yogurt with a teaspoon of lemon juice. Apply the resultant paste to your face and leave it on for about 20 minutes. Wash your face with cold water and apply some rosewater thereafter. You can do this either in the morning before taking a bath, or in the night before going to bed. 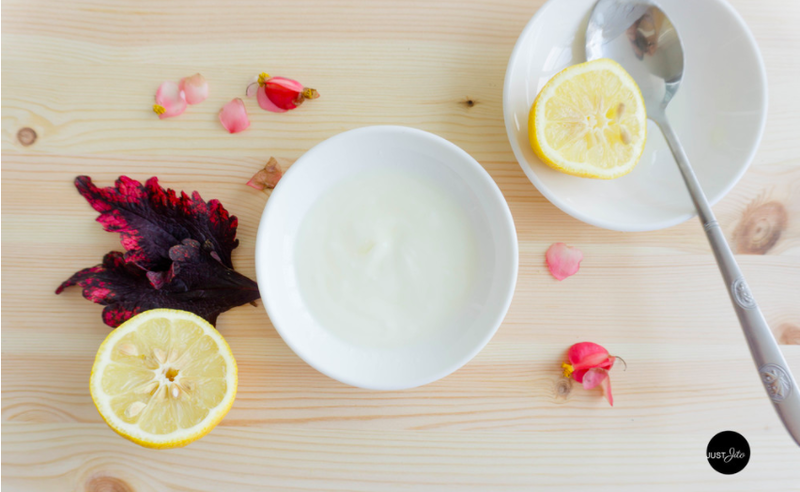 Yogurt and lemon both moisturize the skin and help remove blemishes. Lemon also contains vitamin C that protects the skin from UV damage. Yogurt improves the overall skin texture and even makes skin brighter. Combine a tablespoon of papaya pulp with a teaspoon of fuller’s earth. Apply the paste after splashing your face a few times with warm water. Wait till the paste dries. With damp fingers, remove paste in circular motion. Rinse with normal temperature water. Do this in the morning before you take a bath. 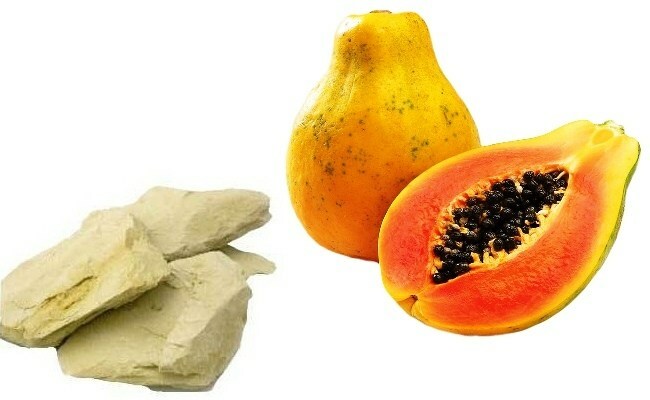 Papaya contains the enzyme papain that exfoliates the skin and makes it smoother. 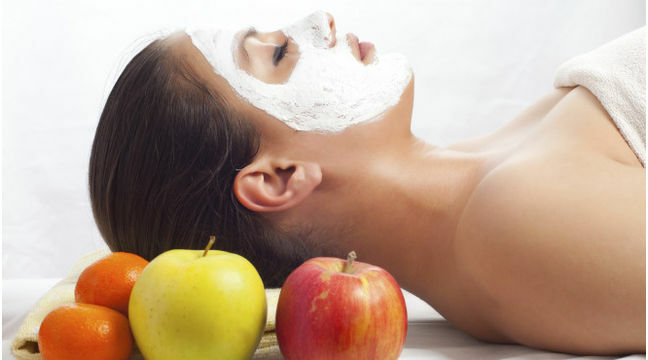 The fruit also repairs and rejuvenates the skin and exfoliated effectively and gently. Fuller’s earth is known to cleanse and tone the skin. Peel the rind off two lemons and two oranges and dry thoroughly in the sun for 4-5 days. Grind to a fine powder and store in an airtight container. Mix a teaspoon of this powder with a pinch each of turmeric and sandalwood powder, and a little rosewater to make a paste and use it to scrub damp facial skin. If you can add a little dried rosemary, the anti-aging properties of this recipe will multiply. You need not wash off immediately. Let it stay on the skin for about 5 minutes. Wash your face with warm water and immediately follow with a cube of ice to close the pores. Do this in the night before sleeping as citrus fruits are photosensitive and can make you tan. The high vitamin C content of lemon and orange rind will brighten your skin and protect it from external pollution, while turmeric will heal and sandalwood will condition the skin. 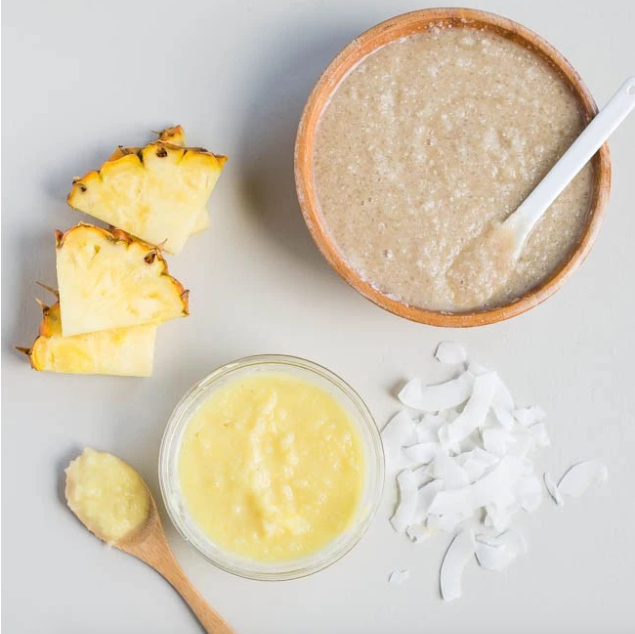 Add half a bowl (or four tablespoons each) of coconut milk, olive oil, raw milk, grated pineapple and sea salts to a bowl and scrub your body with this mixture. Leave on for about 20 minutes and wrap yourself in an old sheet for the goodness of the ingredients to seep into the layers of the skin. This natural salt and oil body scrub is cheap and effective; and works as well as other expensive, chemical-laden body scrubs. It removes the dead skin cells and will also help the skin to attain a glamorous sheen. Mix equal amounts of castor oil and honey and apply to freshly cleansed face. Leave on for about 15 minutes and wipe off gently with a wet and warm sponge or clean flannel washcloth. 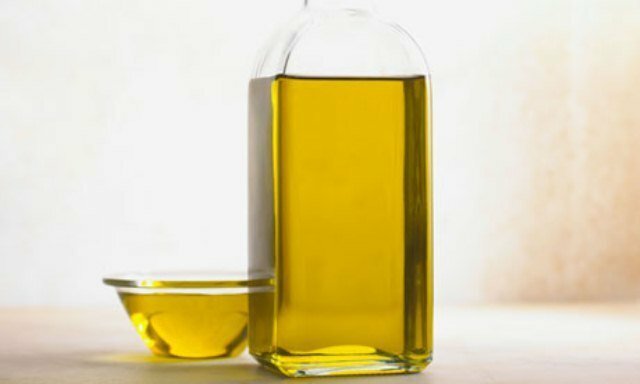 Pure castor oil has the potential to decrease the aging process of your skin. It works wonders by preventing wrinkles and can even soften your skin magically. Seasonal fruits can be used to make a pack for the face that not only effectively removes surface toxins and dead skin, but also nourishes the skin for a glow that is natural and long-lasting. For winters, blitz half an apple, a few pieces of papaya, half a banana and a few slices of orange to make a pulpy pack to be left on the face for at least 30 minutes. For summers, use some mango, watermelon, papaya and add a tablespoon of honey.